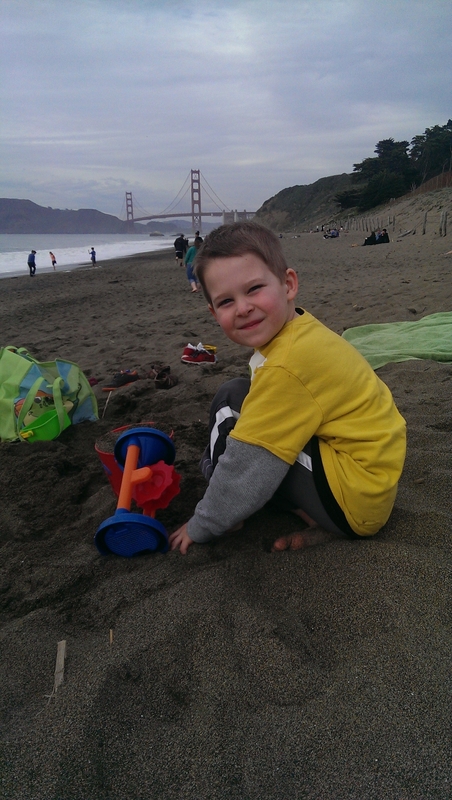 I took my five year-old to San Francisco last weekend to visit a friend of mine and her family. 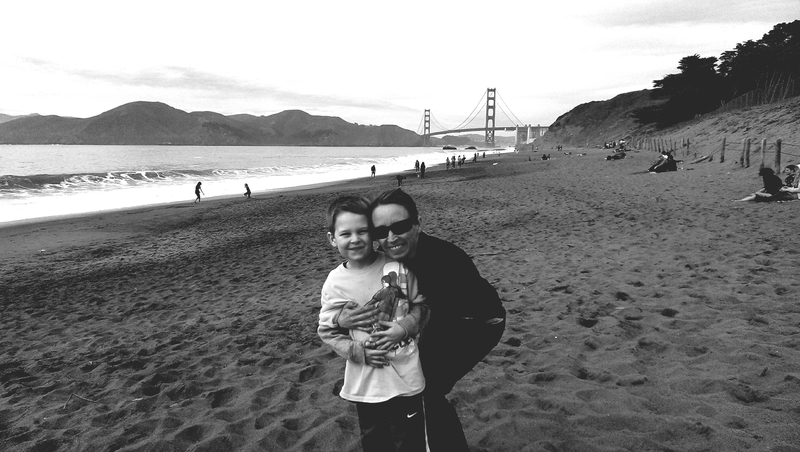 It was Declan’s spring break, so we left the other boys home and jetted off to see a new city. And everything was new and exciting. Having a sleepover….for four nights. Ice cream at Ghiradelli Square. Watching the sea lions at Fisherman’s Wharf. Seeing the Golden Gate bridge. And my favorite. … pure quality time with Declan. Just us. Since having our second, this is hard to come by. While I make efforts to plan special date nights or run errands together, this was the first time since Kellen was born that we really hung out together. And made memories that I will never forget. 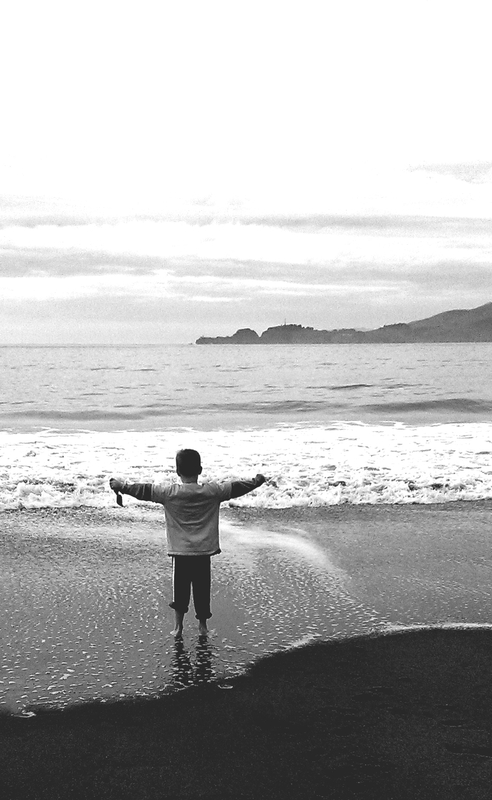 One that sticks in my mind was watching him see the ocean for the first time. And it’s funny how looking back, I cherish that moment even more since it passed. When we got there, it was chilly. Not chilly by MN standards, but it certainly wasn’t swimming weather. Our plan was to see the ocean, play in the sand, and hang out. 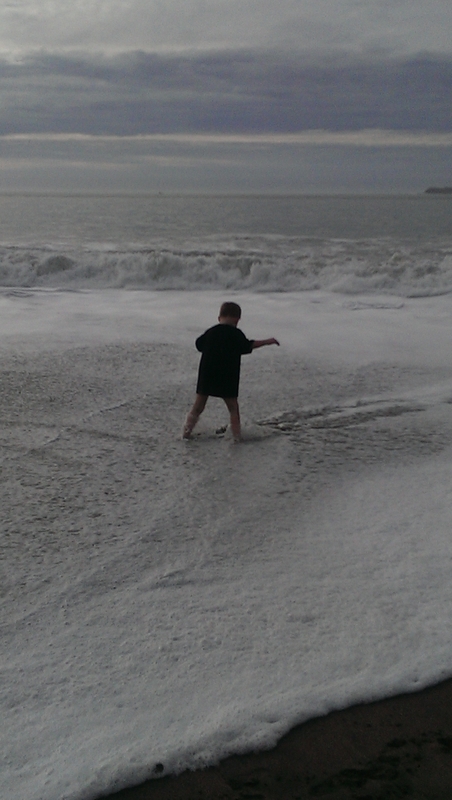 But within seconds of arriving, the kids were in the water and chasing the waves up and down the beach. And the waves were HUGE. Scary huge. And if you know me well, you know I am completely neurotic around water with my kids. Simply and positively neurotic. Always have been. Some may even venture to say I am neurotic about everything…but that’s another story. So as you can imagine, I spent this moment pacing back and forth yelling every five seconds for Declan to come closer. They weren’t even far out. But my heart raced the entire time imagining the waves would swallow him up. So, he continued to run and I continued to corral him back in. They were in heaven. Declan was in heaven. His clothes were drenched. We rolled up his pants several times before giving up and letting him run in his undies. I had never seen him so excited. It was a memory I will never forgot. Equally, a memory I wish I allowed myself to take in just a little more. Because I will never get back. It’s not that I didn’t enjoy it, because I did more than anything. But I spent more time worried about the ‘what if’ that I didn’t really let go and embrace the experience. And now it’s gone. Maybe its just me, but sometimes I feel like I worry so much about what might happen, that I completely lose sight of what is happening right in front of me. Or I worry that if I relax just a little, I may relax too much, something bad will happen, and I will never forgive myself. It’s like when we’re pregnant and you’re not supposed to eat deli meat or have a glass of wine. But some people do and some people say its okay. My personality lends to worrying about everything, so I was one of those people who didn’t risk it. For the just in case. I did take a lot of pictures and just looking at them make me smile. Remembering their incessant giggles. Their scrawny legs as they ran to and from the ocean waves. His saggy underwear and drenched shirt. Just throwing caution to the wind. No fear. Nothing else mattered to him but experiencing that moment. My five-year old taught me something from that day. A lesson about letting go. Living the moment. Breathing it all in. And while I know I can’t redo this moment, I can be more aware of how I experience them. To not worry about what I can’t control. Or work to be done. Laundry piling up. Errands to run. Because that will all get done. It always does. But moments are fragile. Once they pass, they exist only in our memories. And one day these memories will be harder to come by. Harder to remember. Looking back, I would have experienced that moment differently. I would have taken my socks and shoes off, rolled up my jeans and ran in the water with him. I would have built a sand castle. Embraced the cold and wet. Chased him down the beach. Worried less about the what if. And thrown caution to the wind. Previous postIn case you want to ‘like’ me….